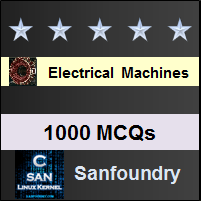 This set of Electrical Machines Multiple Choice Questions & Answers (MCQs) focuses on “Doubly Excited Magnetic Systems”. 1. Which of the following are examples of doubly-excited magnetic systems? Explanation: All of the above applications require two independent sources of excitation. Explanation: Widely used motor/generators such as synchronous and induction machines belong to doubly excited systems, and many other practical applications require multiply excited magnetic systems. The positive sign in the formula indicates that force/torque acts in a direction as to tend to increase both field energy and co-energy. Explanation: Equation for magnetic torque is Te=1/2is2dLs/dθr+1/2ir2dLr/dθr+isirdMsr/dθr , if ir=0, Te=1/2is2dLs/dθr and if is=0, then Te= 1/2ir2dLr/dθr, and these equations for torque are called reluctance torques. 7. Which component of torque in the following equation is called the electromagnetic torque of electromagnetic energy conversion device? Explanation: The torque developed by the interaction of stator and rotor magnetic fields is the electromagnetic torque or interaction torque. 8. Which components of torque in the following equation are called the reluctance torque terms? Explanation: Because the change of reluctance (Rls or Rlr) are responsible for the production of these torques. Positive or negative value of current doesn’t affect the torque direction. The interaction/electromagnetic torque = isirdMsr/dθr, here the direction of is and ir changes the torque. Explanation: Reluctance motors can work on single excitation, and synchronous motors require double excitation. Explanation: Electromagnetic torque = isirdMsr/dθr and if either is or ir =0, then Te=0. Explanation: As the energy storing capacity of the magnetic field is higher, magnetic field as coupling medium is most common in electromechanical energy conversion devices.